Recently, I hosted a medical student in my family medicine clinic in downtown Toronto. She had heard me speak about the social determinants of health (SDoH), and wanted to see how I put these ideas into practice. As we reviewed the patients we’d see that day, we talked about how poverty, precarious employment and poor housing conditions “get under our skin” and impact health outcomes. We had a busy afternoon and saw many people dealing with complex social issues that affected their health. This included a man in his mid 20s who is homeless, making it challenging for him to stay on top of his HIV treatment or engage in services to help him manage his drug use. And a woman in her 50s, also living with HIV, but mostly concerned with precarious employment and her fluctuating income that impacts her ability to pay for medications. And a woman in her 40s who lives in a social housing building that is rife with violence, constantly triggering her anxiety and PTSD. We provided care, but also witnessed and listened to the strategies that these patients have come up with to support their own health in the face of societal and systemic inequities. Not every patient was in crisis. Our catchment area has a mix of neighborhoods, and our waiting room is a cross-section of our diverse city. In Canada, we cherish the idea that all citizens, regardless of their income, deserve access to physicians and hospitals. But from person to person that day, we saw health disparities that exist at a population level. And we knew that access to the health system is only a small part of what determines who is healthy and who is not. At the end of clinic, I checked in with the student. We discussed how clinicians can feel like they are constantly “swimming upstream”, struggling against a strong current of health, social and political factors that limit us to temporary downstream solutions. This can lead to burnout, particularly if one faces these situations all alone. Our Family Health Team includes nurses, social workers, psychologists, dietitians and pharmacists. Everyone has a special role and set of skills, but also, we support one another as we swim in what colleagues in Scotland call the “deep end” of primary care – that is, those areas that face the worst health inequities. 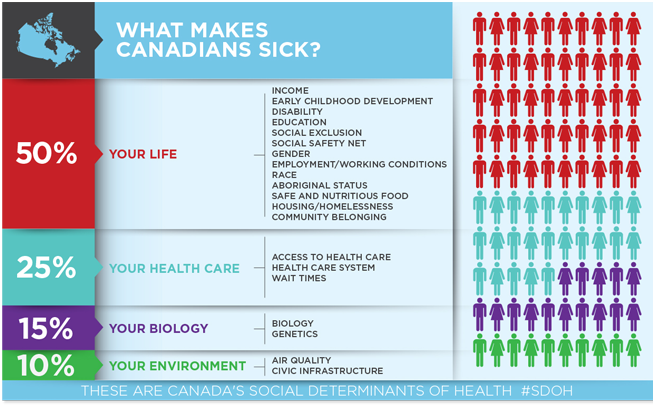 We also need to support our patients by addressing the SDoH. At our Family Health Team, we developed a special committee and a series of new programs. First, we developed a unique income security health promotion service. Building on lessons from the United Kingdom, where several general practices partnered with charities that help people access government benefits, our program helps individuals and families access new sources of income, reduce expenses and build financial empowerment. We also looked to the United States, and obtained funding to start a medical-legal partnership. We began a Reach Out And Read program to improve child literacy and development. Finally, we have begun routinely collecting data about our patients and their SDoH. I shared with the student how these initiatives get started and can be evaluated. To push the boundaries of what we can do, I started a research group called The Upstream Lab within the Centre for Urban Health Solutions at St. Michael’s Hospital. In our Lab we developed and tested an intervention on precarious employment, online tools to help with finances, community initiatives to boost economic resiliency, and even interventions that aim to influence policymakers by applying a SDoH lens to legislation. The priority is to ensure that patients can give feedback on whether these services are supporting them, and to study how these services impact their health and well-being. Whenever we teach students about the SDoH, I think we are challenged to move beyond a “laundry list” of factors to new solutions that address the complex factors shaping patients’ health outcomes. Developing and evaluating evidence-based interventions requires an ongoing revolution in our thinking, including being constantly open to new approaches and the insights gained from working with and collecting feedback from patients. As the World Health Organization noted a decade ago, at the roots of the SDoH is the inequitable distribution of power. The student and I ended our day by chatting about her pre-med experiences in community organizing. Her previous work included collaborating with food centers to build political power among people dealing with food insecurity. Now it was my opportunity to learn from her. With future colleagues like this, I feel optimistic about our collective work of going upstream of the health disparities we see in primary care. This blog post was first published by the North American Primary Care Research Group (NAPCRG). This entry was posted in Uncategorized on May 28, 2018 by Andrew Pinto. ← Can we learn financial resiliency from our peers?